The aeroplane had been sat on the grass at Old Warden for the better part of two decades at that point, its numerous fictitious paint schemes doing little to disguise creeping dilapidation. It was ostensibly a sad end for an historic aeroplane – Spitfire PR.XI PL983 was a rare survivor of more than 400 modified Mk.IXs, with Second World War provenance and a unique post-war racing career. Speed was of the essence for this unarmed photo-reconnaissance variant and the Spitfire’s armament had been removed and the airframe altered with the provision of camera ports, whilst a retractable tail wheel was said to add 5 mph to the airspeed. It also boasted a revised canopy arrangement, with an aerodynamic wrap-around perspex front screen replacing the standard three-piece set-up. Other modifications included the incorporation of 66 gallon sealed fuel tanks in each wing and installation of a larger 14.5 gallon oil tank (replacing the Mk.IX’s 7.5 gallon tank) to facilitate long-range operations. PL983 had been loaned to The Shuttleworth Collection by Vickers Armstrong and flown into the Bedfordshire aerodrome in late 1950 by former Air Transport Auxiliary pilot Johnny Jordan who, incidentally, is said to have been reprimanded for flying down Biggleswade High Street low-level en route to Old Warden. There it remained for 25 years, until the completion of Shuttleworth Spitfire Mk.V AR501’s restoration by a group of Duxford Aviation Society volunteers heralded some respite as attentions turned to returning the PR.XI to flight. The aeroplane was transported by road from Old Warden to Duxford on 30 August 1975, where it was hangared for inspection and strip down under Keith Taylor’s leadership. Romain was volunteering with the East Anglian Aviation Society at the time: “We were talking with the guys involved with that restoration group, and it was obviously a big job. We weren’t ever directly involved in the project, but the aeroplane was in our hangar and we were aware of the sheer volume of work the volunteers were putting in during their spare time, often taking parts away to work on during their lunch breaks”. 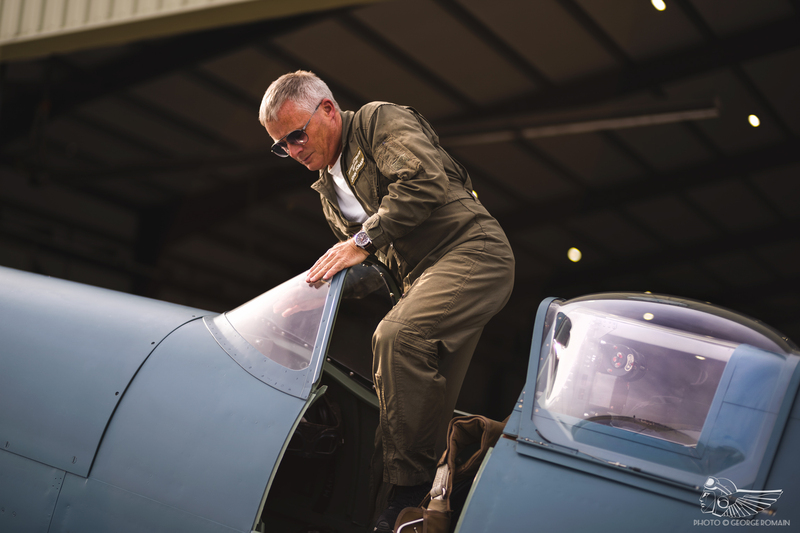 A five-man team led by Steve McManus took charge of restoring the Spitfire’s fuselage. With limited manpower and resources, the task that lay ahead was almost insurmountable. Rebuild of the bulkhead was completed in 18 months. The drilling out and replacement of magnesium alloy rivets took two years. The wing root fairings, corroded by water during the Spitfire’s time outside, were replaced in their entirety. A two-man team focused on the tail unit, drilling out the rivets before conducting a full rebuild and reskin. The volunteers routinely took smaller components such as the control column, rudder bar and undercarriage assembly home with them to work on during evenings and weekends. 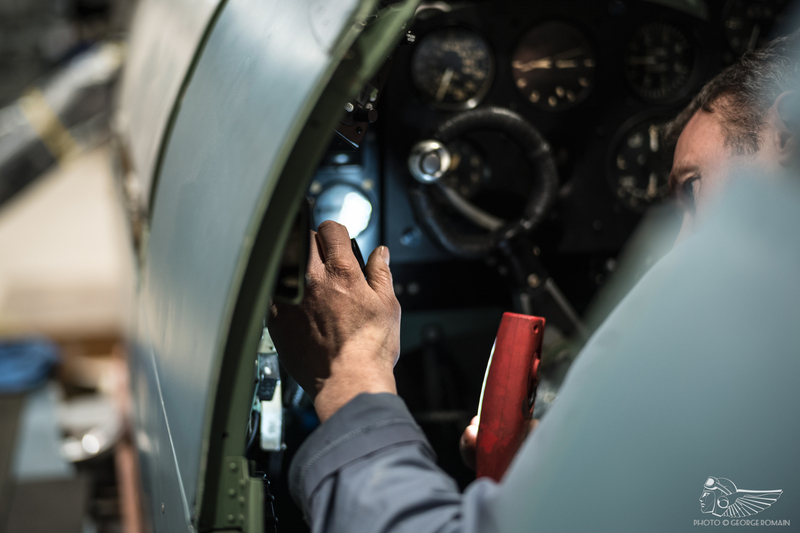 The Merlin 70 overhaul was led by McManus who, along with Keith Taylor, personally acquired numerous fundamental parts including magnetos, ignition harness, starter motor and coolant pump. By 1983, the centre section spars and bulkhead had been refitted and riveted back into the fuselage. The undercarriage units were in the midst of overhaul, the elevator had been rebuilt and was awaiting re-fabricing, and the rudder was approaching completion. 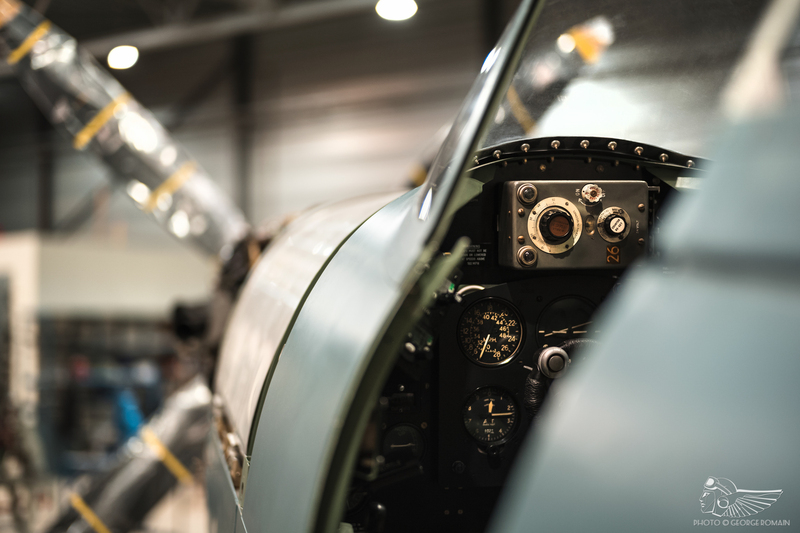 The Spitfire had been entirely rewired and the pneumatic and hydraulic pipes refitted, whilst the port wing and engine were in the early stages of restoration. Though a first flight was still a distant hope, the fact that a small team of volunteers had achieved as much as they had was a testament to their dedication. We can only speculate on the project’s eventual outcome in their hands, for Shuttleworth had run into financially difficulties and accordingly sold the Spitfire (along with their Avro Anson project) in summer 1983. The volunteers were inconsolable; those who had poured hundreds, likely thousands of hours into the restoration saw their work swept away from them in an instant. 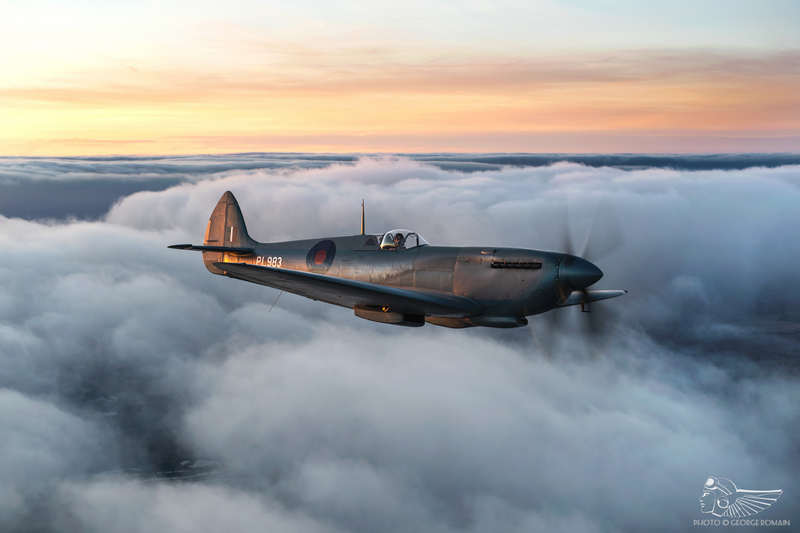 Spitfire PL983 had been put up for auction at Duxford, with Tony Bianchi putting on a solo aerobatic display in Spitfire Mk.IX MH434 to entice potential buyers. The showcase worked, and the winning bid of £110,000 was placed by ex-Armée de l’Air pilot Roland Fraissinet. The son of a First World War ‘Ace’, Fraissinet’s story is an interesting one in its own right. He escaped occupied France in 1942 via Spain, hoping to join the Free French forces. Having been captured, he spent six months incarcerated before escaping in June 1943, finding his way to North Africa and joining a French parachute unit in Casablanca. Eventually Fraissinet reached the UK and underwent training to join the RAF as a pilot; he qualified too late to see service during the Second World War, but converted onto Spitfires nonetheless in June 1945. By 1983, he had over 6,000 flying hours to his credit. 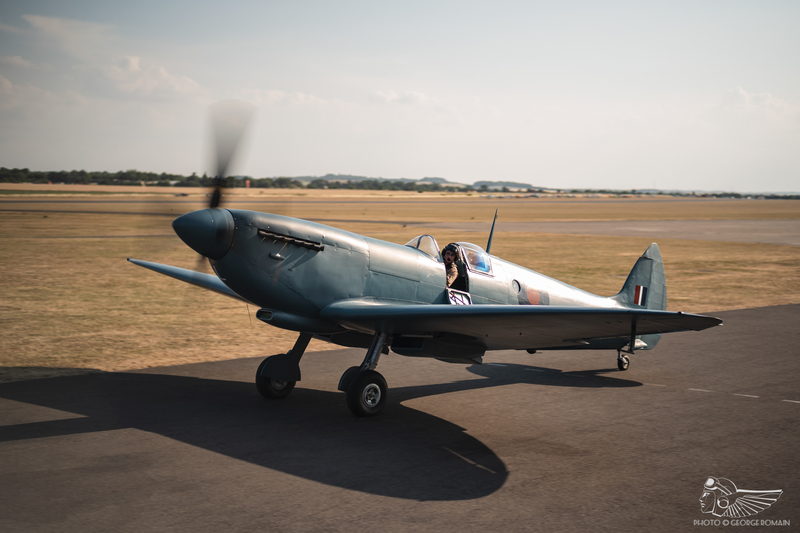 The Spitfire passed initially to the care of Personal Plane Services at Wycombe Air Park, then to Trent Aero Engineering at East Midlands Airport for restoration and there the project resumed under the management of company owners Phillip Tillyard and Dan Taylor. The original Merlin 70 engine was in a state of disrepair, some parts having been taken away for restoration whilst cylinder blocks had been removed and installed in Spitfire Mk.V AR501’s Merlin 45; Fraissinet opted instead to mate his Spitfire with an American-built Packard Merlin 266, with Pete Rushen supervising the installation. He also chose to replace the PR.XI’s 14.5 gallon oil tank with the standard 7.5 gallon oil tank, an offshoot of which was the fitment of standard Mk.IX cowlings instead of the distinctive bulbous chin cowl. The restoration also saw the replacement of the wrap-around perspex front screen by a three-piece Mk.IX windscreen – collectively, these changes gave PL983 the outward appearance of a Spitfire Mk.IX, with little left to identify it as a photo-reconnaissance variant. 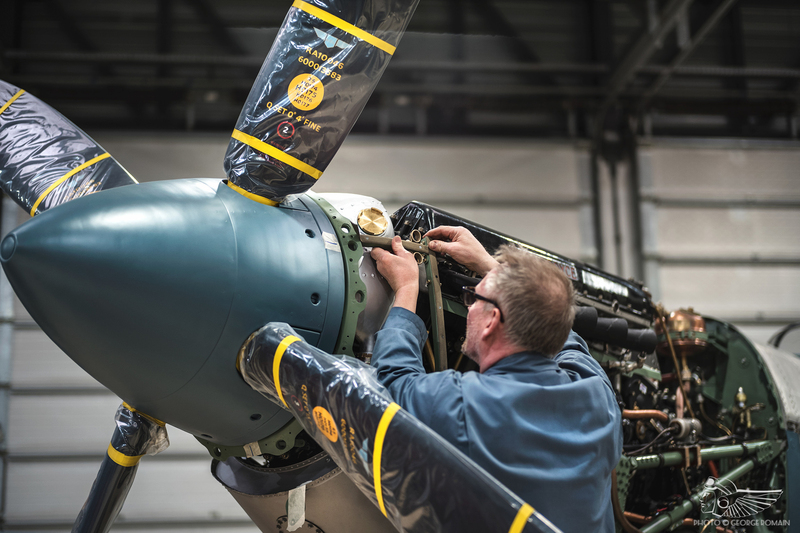 Trent Aero re-spared both of the Spitfire’s wings, and completed the restoration of numerous systems and parts – in total, 6,000 man hours went into getting the Spitfire airborne again. Registered as G-PRXI, PL983 flew again on 18 July 1984 with Rolls-Royce Chief Test Pilot Herbert Clifford Rogers at the helm. The Spitfire was active on the European airshow circuit until it was sold to Doug Arnold’s Biggin Hill-based Warbirds of Great Britain collection in the late 1980s, thereafter moving into storage at North Weald for several years after Arnold’s death in November 1992 before Justin Fleming acquired it at the turn of the century. “The PR.XI eluded me during that period,” says Romain, “until I got involved with the Piece of Cake filming in 1988. That was the first big filming project I was involved in, and I was invited by the Hannas to fly their Harvard as a camera-ship. There PL983 was again, sitting next to my wing. It was used for some of the more unusual shots, such as where Moggy flies in formation inverted. “When Justin Fleming bought the aeroplane in late 1999 he sent it to Martin Sargeant’s facility in Kent”, John continues. “He restored it to flying condition largely in-house, but it was a good aeroplane and they turned it around relatively quickly. In Martin Sargeant’s hands, the Spitfire flew into Duxford a few times and I saw it once or twice at UK airshows. The next time I saw PL983 was on the concrete at Rouen on 4 June 2001.” That was the scene of an air display at the Valle de Seine Airport in Normandy where 11 Spitfires had assembled for a major flypast, amongst their number Martin Sargeant in PL983 and John Romain in the ARCo-operated Mk.XVIII SM845. During the climactic formation flypast, the Spitfire PR.XI suffered onset engine issues and peeled away from the formation, turning back towards Rouen to make a precautionary landing on the designated grass emergency strip. That, Sargeant found, was occupied by spectators, necessitating a protracted circuit to land on the main hard runway. During this extended base leg, the Spitfire coughed a thick plume of black smoke and its propeller slowed rapidly; the aeroplane almost immediately dropped into a stall and impacted the ground vertically. The crash claimed Martin Sargeant’s life. He was 56 years old. Manufactured by Vickers Supermarine in Reading, Berks, PL983 first flew from Aldermaston in October 1944. It passed through 6 Maintenance Unit (MU) at RAF Brize Norton on the 31st of that month, moving to No. 1 Pilots Pool, Photo Reconnaissance Headquarters at RAF Benson on 24 November 1944, where the cameras and photo-control equipment were installed (including fitment of a small radiator run off the main engine coolant system, used to heat the rear fuselage camera bay). Delivery to 34 Support Wing followed on 5 January 1945. Operation Bodenplatte, the Luftwaffe’s final major offensive of the Second World War, had decimated a proportion of the RAF’s Spitfire PR.XI fleet in the Netherlands on 1 January 1945. Accordingly, PL983 was one of the Spitfires drafted to No. 4 Squadron at Gilze-Rijen as a replacement airframe, and ferried to the Netherlands by Flt Lt John Sams AFC in appalling weather. With heavy snow storms and low cloud hampering the ferry flight, Sams was forced to bolt into Maldegam, Belgium, where the Spitfire sat until 13 January 1945. Once operational with No. 4 Squadron, it was principally engaged in the high-altitude daylight photography role in support of the Canadian Army’s advance up the west coast of Holland, conducting reconnaissance of troop concentrations, armour and tank movements, and artillery positioning. Following a move to Mill, 20 miles north-east of Eindhoven, in early March, PL983 was active again on 23 March 1945, providing mosaic photographic coverage of an 100sq. mile area around Arnhem with Sqn Ldr Charles Harris St John DSO DFC at the controls. As the end of the war drew tangibly closer, No. 4 Squadron’s photo-reconnaissance pilots found themselves largely redundant as the Allies rapidly advanced over what remained of occupied Europe, turning instead to anti-submarine patrols, shipping reconnaissance and communications flights. It was an uneventful end for a unit that had played a vital, oft unsung role in Europe’s liberation. After VE Day, PL983 moved to No. 2 Squadron at Hustedt, Germany in September 1945, then to Celle a few days hence. The aeroplane returned to the UK in early January 1946, passing through various Maintenance Units until it reached No. 33 MU at RAF Lyneham for disposal in May 1947. There its military equipment was removed, and that July the Spitfire was passed to Vickers Armstrong at Eastleigh to prepare for civilian life. The Spitfire had spent much of its brief service life with No. 4 Squadron, and it is in these markings that ‘L’ flies today. The principal restoration began with Airframe Assemblies on the Isle of Wight, who were responsible for rebuilding the fuselage. Though the full photographic units aren’t currently fitted to ‘L’, a lens has been temporarily mounted in the port camera window for effect, and ARCo is searching for original cameras to install in the aeroplane. 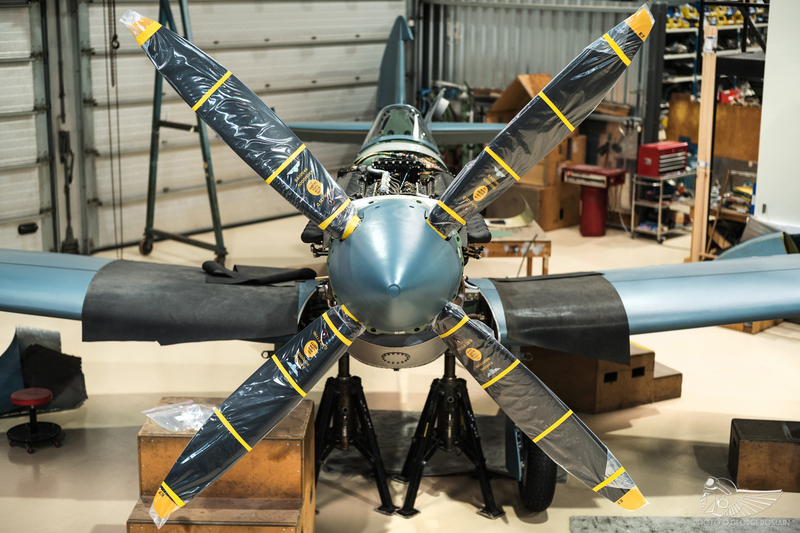 These assemblies necessitated internal modifications unique to the photo-reconnaissance Spitfires, with additional pullies within the fuselage redirecting the elevator and rudder control cables around the camera units.  HFL, meanwhile, was responsible for manufacturing the wings in-house. The PR.XI leading edge 66 gallon wing tanks did not feature in the restoration, and currently ‘L’ flies with the standard dual fuselage tanks (with a maximum capacity of 85 gallons) positioned forward of the cockpit. Another significant recovery was the original Merlin 70 engine that had been mated to the Spitfire when it arrived at Old Warden in the 1950s, which was rebuilt by Retro Track and Air Limited. 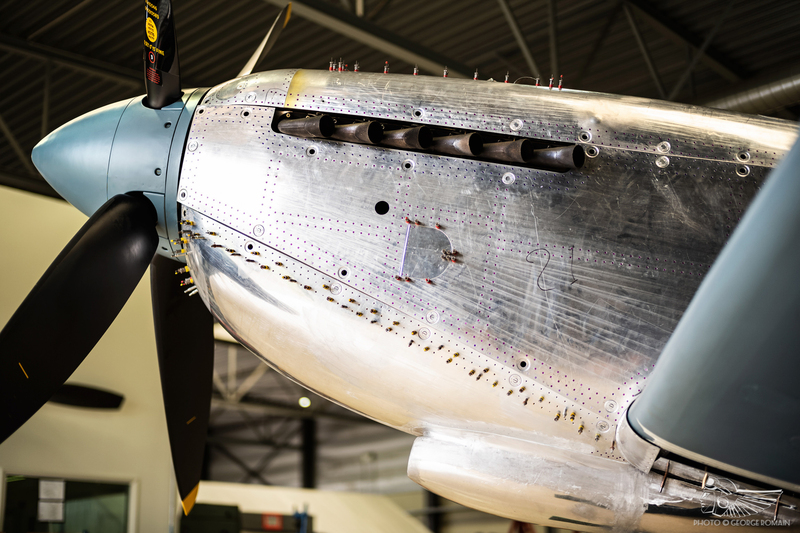 The four-blade Dowty Rotol propeller was built up by Skycraft Services Limited, with the propeller hub sourced from another Spitfire (believed to be famous Mk.IX MH434); the original hub was restored and lives on in another of ARCo’s Spitfires. The undercarriage was completely overhauled and refitted, and a significant number of systems were restored or repaired and reinstalled. 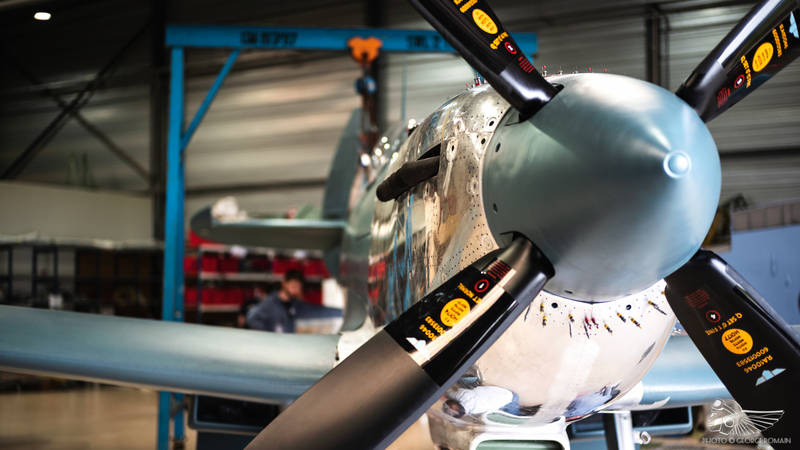 Over time, these individual elements slowly came together under HFL’s roof and the Spitfire took shape. With the principal restoration concluded and the aeroplane fully assembled, attentions turned to preparing ‘L’ for its first post-restoration flight. Engine runs led into tie-down high-power checks, with HFL’s Chief Engineer, Martin ‘Mo’ Overall, carrying out the initial runs to bed the engine in. It was then a case of weighing the aircraft, working out the centre of gravity (CoG) and placing lead counterweights in the tail to move the CoG aft, before the Civil Aviation Authority conducted its final paperwork review and survey. Paperwork signed off and pre-testing engineering complete, ‘L’ took flight once again from Duxford on 18 May 2018 with Romain at the controls. “As soon as you’re airborne, the first thought process is to test the ailerons with lateral control inputs”, he says. “Then you’re pulling the boost and propeller pitch back to +4 1b./sq/.in boost and 2,400 to climb to around 2,000ft in the downwind. Inevitably you need to trim the ailerons after the first flight by bending the trailing edge very slightly. They’re very sensitive to any defamation in that area, and if there is something amiss with an aileron, it can be quite a heavy and disproportionate load as the airspeed increases. The boys trimmed the ailerons perfectly, and she was pretty much flying straight from day one”. With its wrap around canopy, smoothly faired wings and retractable tail wheel, ‘L’ boasts a particularly drag-efficient profile. Cruising at power settings of +2 1b./sq/.in and 1,850rpm, avoiding negative boost whilst bedding in the engine during the flight testing, produced an airspeed of 230 mph. “First impression, this is quick“, recalls John. “She’s a good 10-15 mph quicker across the airspeed range than a Mk.IX; a real race horse. We took it to VNE (Velocity Not Exceeded) of 405 mph in a shallow dive from 9,000ft at +4 1b./sq/.in and 2,400 rpm. At the opposite end of the range, it stalls with gear and flaps down at 62 mph, nodding along with lots of elevator buffet and no wing drop before the stall. One consequence of the push for a more aerodynamic design is that the gear blow down system doesn’t blow down the retractable tail wheel, and pilots will need to be aware of that should they ever need to utilise that in the event that they encounter technical issues in-flight”. Summer air testing saw ‘L’ typically showing coolant temperature in the region of 80°C and oil temperature of 65°C, with the oil pressure sat purposely high at 90psi. “We try to run all our fighters at 90psi”, says John, “which is on the higher end of the scale, but we prefer it that way in case we run into problems. You could run at 55psi by the book, but that gives you nowhere to go if you have an issue – if, for example, your oil temperature is climbing off the clock, the oil pressure will drop very rapidly. That’s particularly important during the testing phase, when you are, by definition, more likely to encounter issues with an engine that is bedding in”. Conservative power settings of +4 1b./sq/.in and 2,400rpm are comfortable for a full vertical aerobatic profile, the lack of drag allowing the aircraft to pick up speed very quickly downhill and making it an excellent air display mount. John continues: “The controls are, in some ways, better harmonised in the PR.XI than on some of the other marks of Spitfire. You often find a Spitfire may have a very light elevator, reasonably heavy ailerons and a light rudder, and the control inputs vary accordingly. In the PR.XI, the added pullies to the elevator and rudder mean those controls have a bit more stiction; that means the rudder, elevator and ailerons feel a lot more harmonised, making it particularly pleasant to fly”. ‘L’ rejoined the airshow circuit in July 2018, appearing on static at Hetheringham Hall and RAF Cosford before making its public flying display debut at Duxford’s Flying Legends in July. There she flew alongside ten other Spitfires, from marks V to XVIII, in the show-opening Spitfire scramble, massed formation and tail chase sequence. The aeroplane went on to fly with the only other airworthy Spitfire PR.XI, the Hangar 11 Collection’s PL965, at its former home at Old Warden in early September 2018. John was at the controls, joining Peter Teichman in ‘965 for a number of formation passes before the pair split into their respective solo routines. Eleanor Lettice Curtis, born 1 February 1915, has been described as “arguably the most remarkable woman pilot of the Second World War”, having flown as an aerial surveyor pre-war before joining the Air Transport Auxiliary (ATA) in June 1940. She was amongst the first women to fly for the ATA, initially piloting lighter aeroplanes at Hatfield before progressing to advanced twin-engine and high-performance types. By the time Curtis left the service on 31 March 1948, she was amongst the ATA’s most experienced aviators, with flights logged in hundreds of Spitfires, Hurricanes, Mosquitos, heavy bombers and a myriad of other aeroplanes. Curtis’ association with Spitfire PL983 began in winter 1948. The aeroplane had been ferried to Vickers’ South Marston base on 22 December 1947, and a little over a month later was positioned to Eastleigh to be handed over to the US Embassy Flight in London. 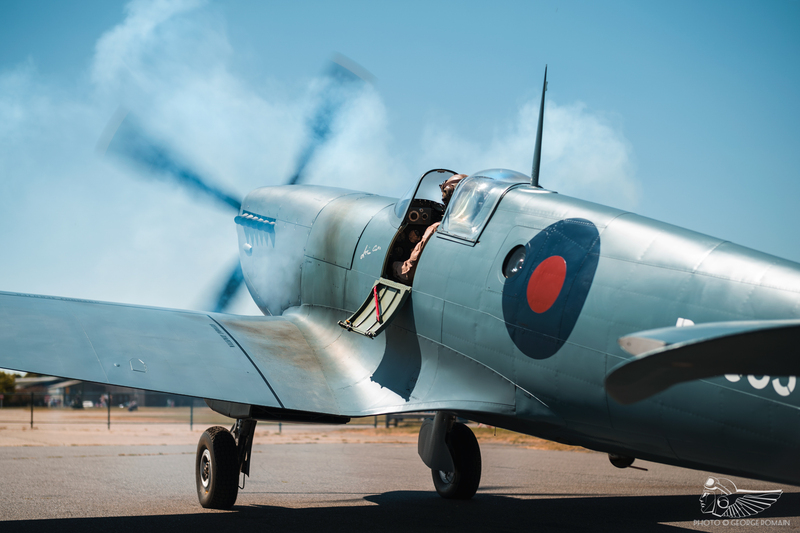 Registered NC74138 and dubbed the ‘first American Spitfire’, it would serve as a personal transport to Livingstone (Tony) Satterthwaite, the US Embassy’s Civil Air Attaché. Its journey down this particular path is an interesting one – Sir Peter Masefield, the first British Civil Air Attaché at the British Embassy in Washington D.C., had previously utilised Percival Proctor G-AHGN to serve as a personal transport. Tony Satterthwaite, perhaps envious of his counterpart’s good fortune, requested his own ‘hack’ and was duly directed to apply to the Air Ministry for a surplus Fairchild Argus, an aeroplane he found to be somewhat lacking in performance. 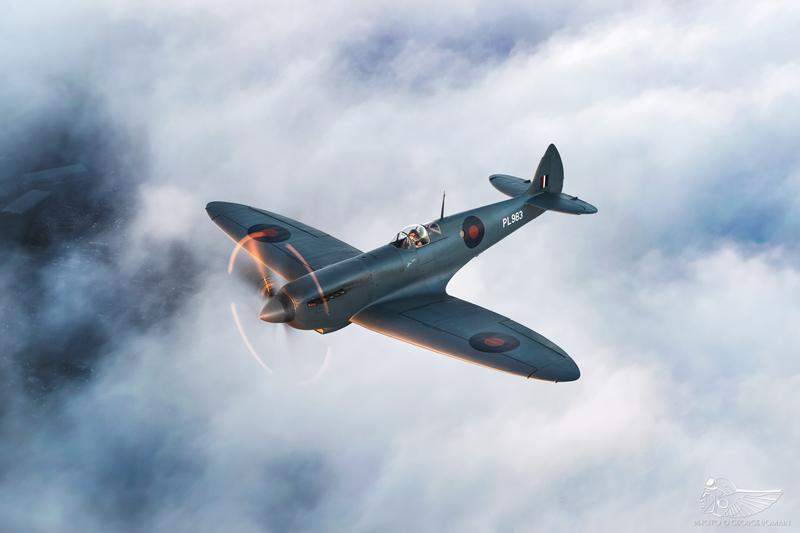 He asked instead to be gifted a surplus Spitfire, and on 14 April 1948 the US Embassy approved his somewhat brazen request: “I have the honour to report that the Ministry of Supply has made available to the Embassy for use of the Civil Air Attaché a Vickers-Supermarine Spitfire Mk.XI. Spitfires are now obsolete as fighter aircraft in the RAF, having been replaced operationally by jets. Production of Spitfire has been discontinued. There are, and have been, therefore, many surplus Spitfires, and the one turned over to the Embassy presumably would either have been salvaged or pickled for future use. Mark XI Spitfires are photo-reconnaissance types, fitted with long-range tanks and have no guns or armour. 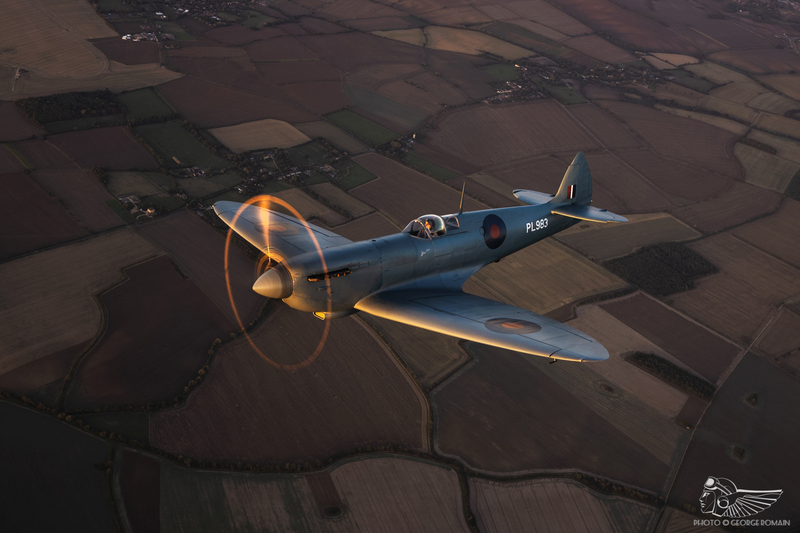 The Embassy Spitfire has been registered under American registry by the Civil Aeronautics Administration. The number is NC74138”. 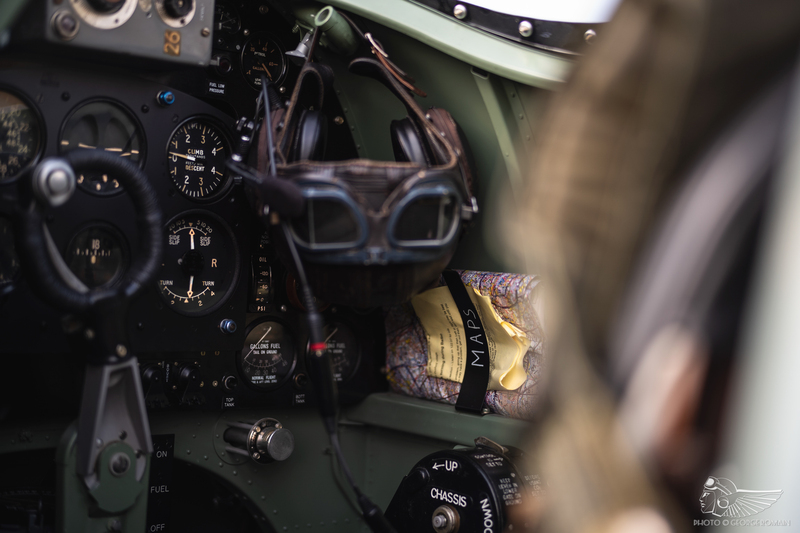 Though well-versed on the US Embassy Flight’s Harvard, Satterthwaite approached his new hack with apprehension, and it was with good grace that he accepted Lettice Curtis’ offer to fly the Spitfire on his behalf. Curtis made the ferry flight from Eastleigh to the Spitfire’s new home at Hendon on 27 January 1948; her first Spitfire sortie in three years. Former Schneider Trophy winner and photo-reconnaissance pilot Air Marshal Sir John Boothman was in residence at Hendon at the time, and presumptuously telephoned Satterthwaite the following day to congratulate him on his first Spitfire landing. “Inevitably he was somewhat shaken to be told the pilot had in fact been a woman”, wrote Curtis. The Civil Air Attaché’s first flight in PL983 followed on 25 February 1948 at Bovingdon, an aerodrome he deemed more suitable for a formative Spitfire sortie than Hendon’s short grass runways. 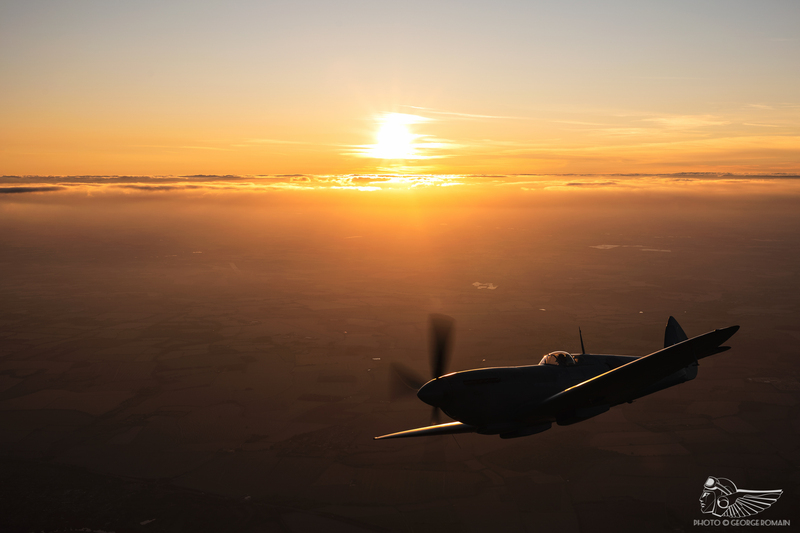 Curtis, meanwhile, continued to fly the Spitfire throughout the spring and summer, making frequent trips out of Hendon and Boscombe Down. During one such sortie from Bovingdon to Boscombe Down in the US Embassy Flight’s Harvard, Curtis and Satterthwaite dropped into Thruxton aerodrome; there they learned of a forthcoming Air Day to be staged by the Wiltshire Flying Club on 15 August 1948. The event was to feature a handicap air race open to all types of aeroplane – Lettice suggested entering the ‘American Spitfire’, to which Tony agreed on the proviso that he would also enter the race in the Embassy’s Harvard. 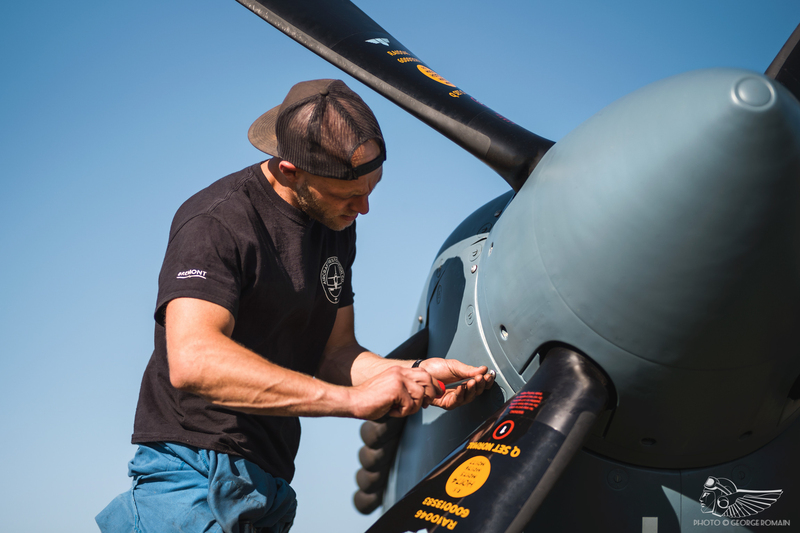 Accordingly, on 12 August the Spitfire was positioned to Boscombe Down to prepare for the race, with engineers looking at the Merlin 70, servicing the aircraft and applying race number ’18’ to the tail. Curtis would need to fly the Spitfire at maximum continuous power of +12 1b./sq/.in (maximum boost available in this de-rated Merlin, +18 1b./sq/.in having been available in-service) and 2,850 rpm for 30 minutes over a 75-mile race course from Thruxton to Totland Bay on the Isle of Wight and back; a far cry from the standard recommended cruise power settings of 0 1b./sq/.in and 2,000 rpm she was familiar with during her ATA days. In the event, an Auster Arrow led off the race participants, followed five minutes later by an Auster Autocrat. Lettice Curtis sat on the ground in Spitfire PL983 as a succession of light vintage types got airborne, amongst them Austers, de Havilland Puss Moth, Miles Magister and Percival Proctor V. Some were reportedly seen circling the nearby countryside, looking for visual references that might set them back on the course, and never threatened to close on pole position. 30 minutes after the Auster Arrow departed, Curtis fired up and took off, climbing to 2,000ft and reducing propeller pitch from 3,000 rpm to 2,850 rpm – the only power adjustment of the race – and maintaining take-off boost of +12 1b./sq/.in. The Spitfire hurtled around the course, rapidly bypassing the lighter aeroplanes and closing the gap on the lead aircraft, a Proctor flown by Bruin Purvis, Chief Test Pilot of the Civil Section in which Curtis worked at Boscombe Down. Purvis had a clear run on the finishing line, trailed by the Auster Arrow and Miles M.27. Confident of his impending victory, it was with alleged chagrin that he observed the Spitfire shooting past his Proctor just seconds before he crossed the finishing line – Curtis had cleanly won the air race, averaging 318 mph, followed by the Proctor, Auster Arrow, Miles M.27 and Magister. Her victory was met with a rapturous response; “A woman turned to her husband and said, ‘We are equal to you any day,'” the local Andover Advertiser newspaper reported. Come race day, the participants started up and taxied out, positioning at the holding point to the west of Lympne’s big grass strip to take-off towards the sea. Light and variable winds posed a challenge and, seeking to avoid a tailwind, the Vampires requested to instead take-off east-to-west; permission granted, the aeroplanes taxied across the airfield to reposition. In the course of the protracted taxi, the Spitfire PR.XI’s temperature actuated radiator flaps automatically opened as the coolant temperature spiked. With no manual control available, the radiator flaps would remain open until the temperature stabilised – good for the engine, but not conducive to high-speed air racing, as Curtis would soon experience. Curtis was airborne second, with a 5 minute 29 second start over John Cunningham, who would take-off last in his up-rated Goblin-powered Vampire. The Spitfire’s radiator flaps remained open for the first three laps, inducing enough drag to place the aeroplane at a distinct disadvantage. Once the coolant temperature dropped below the redline, the radiator flaps automatically closed and Curtis noted a 7 mph increase on the fourth lap, deducing that the change of runway may have cost her the race. One can now only imagine the aural delights of Goblin, Griffon, Merlin and Centaurus engines going great guns at low-level around the racecourse. In the event, Leslie Colquhoun in the Spitfire Mk.TVIII won the race (averaging an airspeed of 324 mph) and claimed the £100 prize money, followed in succession by John Cunningham in the Vampire and J.O. Matthews in the Firefly. Lettice finished fifth of eight participants, placing behind John Derry’s Vampire and ahead of W.J.G. Morgan in the Spitfire Mk.XXIV. It was a respectable result in view of the strong competition from the field of high-performance piston and jet participants. More notably, she walked away with the FAI Class C Certificate for a British Women’s National Record for achieving a speed of 313.208mph over a 100km closed circuit course, awarded by the Royal Aero Club. In doing so, 33-year old Curtis claimed the record held by American Jacqueline Cochran in 1940 (292.601mph) – a British pilot in a British machine entered by an American, claiming the record held by an American aviator! Lettice’s ferry flight to Hendon a couple of days after the race marked the last time she flew PL983; Satterthwaite, described as “one of America’s most ardent Anglophiles”, was subsequently posted back to the US Department of State in Washington, D.C., and though he discussed flying the Spitfire transatlantic, the terms of the aeroplane’s loan precluded it from leaving the UK. Livingstone (Tony) Satterthwaite was sadly killed in a helicopter crash in Greenland in October 1959. Eleanor Lettice Curtis, an inspirational aviator with a towering personality, died on 21 July 2014. She was 99 years old. Romain muses, his eyes coming back to that black and white family photograph: “In the early days of my aviation career, back in the 1970s, I was affiliated with the group restoring the aircraft and it’s appropriate that I’ve been responsible for facilitating its present day restoration. To an extent, we’ve been able to complete the work that they started. “I met Oscar Bosche whilst flying the Bf 109E in Canada. Apart from talking Messerschmitts, we talked about the Bodenplatte operation he led on 1 January 1945. They went straight across Eindhoven airfield and destroyed three PR.XIs, amongst dozens of others. This aeroplane was flown out to replace the Spitfires that Oscar and his boys had blown up. He later sent me a signed pencil sketch of his Fw 190 on the way to carry out that attack. That’s another one of those lovely aviation history links. With thanks to John Romain and the Aircraft Restoration Company.